Rail service along the coast will be suspended beginning Saturday through 5 a.m. Monday from Oceanside to San Diego for track and station improvements, according to the San Diego Association of Governments. The scheduled rail work in Cardiff-by-the-Sea, Carlsbad and San Diego is the first of two weekend-long closures for track and signal improvements along the corridor. Service will also be suspended from Oct. 20 to Oct. 22. Rail service for the four railroads affected by the closures — the North County Transit District, Metrolink, Amtrak and freight line BNSF — is expected to resume Monday for morning commute hours, albeit with possible delays. 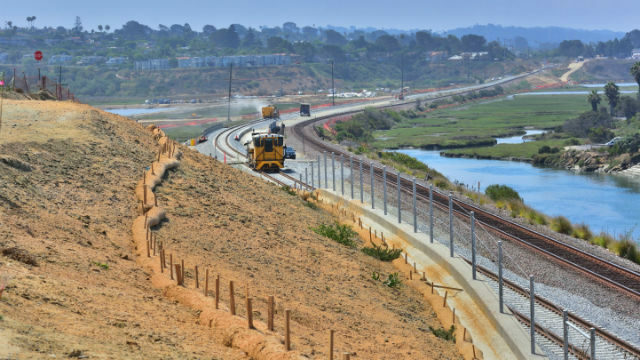 Crews in San Diego will work on improvements to the new San Diego River Bridge and structures along the Elvira to Morena Double Track Project. In addition, NCTD crews and San Diego’s Metropolitan Transit System will make improvements to track crossings at the Old Town Transit Center.